This is the Ace Forex Signals table. It is what you will see when you sign into your account. It is very easy to follow as you can see. You’ll see the Currency Pair, Signal, Entry, SL and 3 TP levels. For further clarification you will also see when the signals get posted and what the last update was. As you can see the Entry was updated for 5 signals. 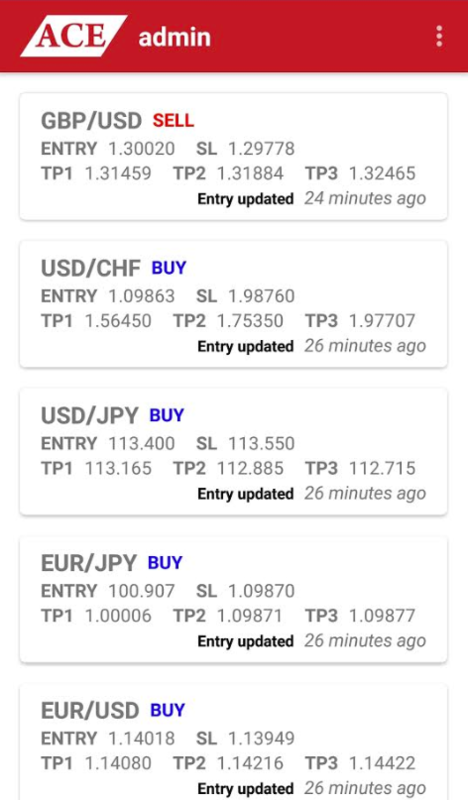 The same info will show up directly on your mobile phone with the Ace Forex Signals iPhone or Android App. Remember: All our signals are to be used as “Pending Orders”. To learn how to place Pending Orders on MT4, please check the video below.